Anti condensation heaters are used to protect customer enclosure, electric panel or switchgear cabinet against problems brought on by temperature variations such as condensation. Such conditions are likely to occur when ambient temperature is low and the equipment inside the enclosure is not powered or fails to dissipate enough heat to keep enclosure temperature above the dew point. Outdoor electrical cabinets, for example, are almost always in such conditions. All electrical cabinets emit certain amount of heat to the surroundings through the surface. So the required anti condensation power is proportional to the effective surface area of the enclosure. The blue lines in the graph represent different temperature elevation. Knowing the effective surface area, you can find the corresponding anti condensation power required for the enclosure heater. The table below shows the effective surface area calculation for control panel / electric cabinet mounted at different locations. 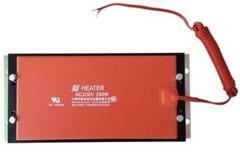 The anti condensation power calculation for a motor space will take another approach, which will be explained in the product page of motor space heater.